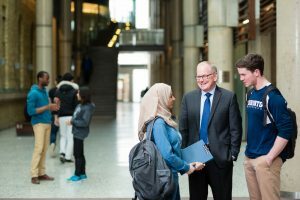 Faculty Registrar Don MacMillan speaks with U of T Engineering undergrads. The best way to contact the Registrar’s Office is in person (GB 157). Email inquiries will be answered within 2-3 business days. During peak periods, the response time may be longer. Phone calls during peak hours may not be answered if the student services representatives are assisting with in-person inquiries.